Is it safe for your dog to eat Bacon? Read more to find out. Pet owners do love their dogs and want to be sure their canines are always well fed. Giving a dog a food treat now and then can be a good idea as well as doing so certainly can help the dog’s disposition. Bacon is one of those common table foods humans may think about giving to their pet, but is bacon a good choice for a canine? 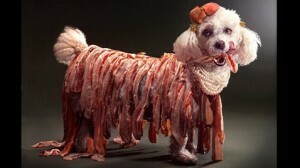 Here is the startling news: bacon is extremely unhealthy and downright dangerous for dogs. Bacon is a very fatty food, which means it can cause attacks of pancreatitis in a pet. Pancreatitis is a serious condition that can have fatal results. That means bacon comes with the potential to actually kill a dog even if bacon remains a small part of the dog’s diet for a short period of time. Nothing good can come out of giving a dog a serving of bacon. The fat the dog absorbs is going to be compounded by all the grease the serving soaks up. Grease can cause all manner of gastrointestinal problems among other issues. The salt in bacon can cause major problems as well. The extremely high amount of salt in bacon can lead a dog to drinking a massive amount of water. This, in turn, leads to the dog suffering from the condition of bloat. Once heavily bloated, the dog experiences a massive amount of gas. The twisting of the gas inside of the dog could lead to a fatality. Among the best ways to care for a dog is to always feed it a good diet. Bacon most assuredly does not fall on the list of good quality foods. What do other dog owners have to say about whether their dogs can eat Bacon or not? See comments below. Know if dogs can or can't eat Bacon? Help other dog owners by leaving a comment.